Post ConstructionTermite Treatments: Residential, multi-family , and commercial structures. Pre Construction Termite Treatments: Residential single family homes only. Full Treatment- only a pre-treatment can be a full treatment. 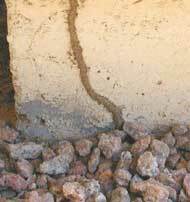 A termite pre-treatment is applied by broadcast spray to the soil of a foundation before a concrete slab is poured. Partial Treatment- example would be and exterior perimeter treatment with termidor, including, or excluding interior plumbing areas application. Spot Treatment- A 10 ft. or less area. Most often as a preventative measure to mitigate a conducive condition. Limited Treatment More than a Spot treatment, but less than a Partial Treatment. Our chemicals of Choice For Termite Extermination. Termidor, the #1 termite defense product in America. It is effective, fast, long lasting, low dose, with no odor. Termidor Foam and Delta Dust are non invasive ways to treat certain inaccessible voids. HomeGuard/Truth Termite Bait System. Sometimes combined with a Termidor liquid or Foam application. GREEN PRODUCTS: Armor-Guard, Tim Bore and Bora Care. All three products contain the same active ingredient, Disodium Octaborate Tetrahydrate, and can be used for GREEN pre-treatment and post construction termite treatments.